A month ago, I got an e-mail from Mary Pride stating that I had been nominated for a Practical Homeschooling Magazine Reader’s Choice award. I was surprised – Build Your Library is still a pretty new curriculum, and excited that someone had nominated us. I didn’t really expect much, especially when I saw the competition. I was up against many well-known and established big name standards in the homeschooling world… companies that had been around since before I had even started homeschooling 12 years ago. I shared the link to vote on social media, and then forgot all about it. After all, with all that competition, I was the underdog, and not likely to get many votes. 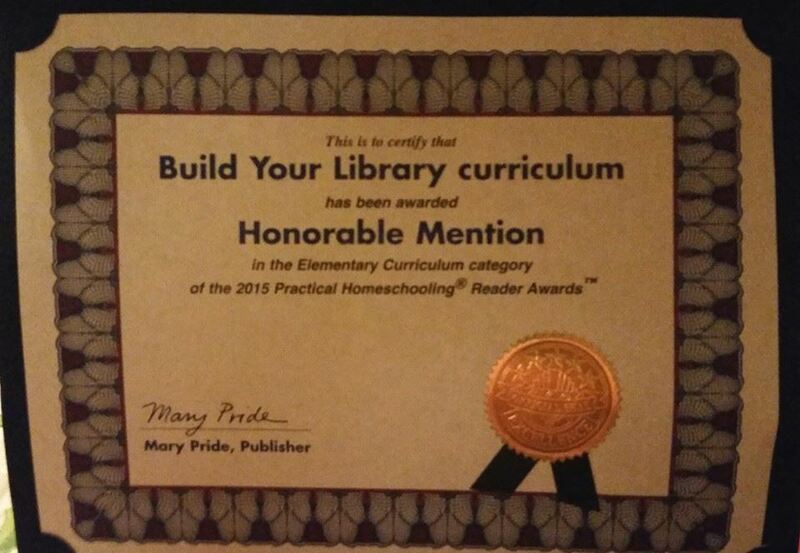 Well, last week I heard that I had actually received Honorable Mention in the Elementary Curriculum category. I nearly cried. I really wasn’t expecting it, and I’m still kind of amazed. So if you voted, thank you. It really does mean the world to me. I have amazing customers, and I’m thrilled that I get to play a part in helping you to educate your children. [Customer Testimonial] Just wanted to say that we have now been using Build Your Library unit studies for many months (we have finished Thanksgiving, Christmas, on week 4 of Darwin and Evolution, haven’t started Harry Potter and still working on WWII.) I also have switched from Bookshark year 5 to starting Build your library Grade 6 next year with my 9 & 11 year olds. We absolutely love your curriculum. The reading is not so much that the kids lose interest like we have experienced with other programs. It is the perfect amount and the books are GREAT! Calpurnia Tate is an instant favorite. Her hands on approach mixed with the books is just fantastic. We can’t wait to dive into next year! !~ Thanks so much for creating/selling/sharing your homeschooling curriculum with us!